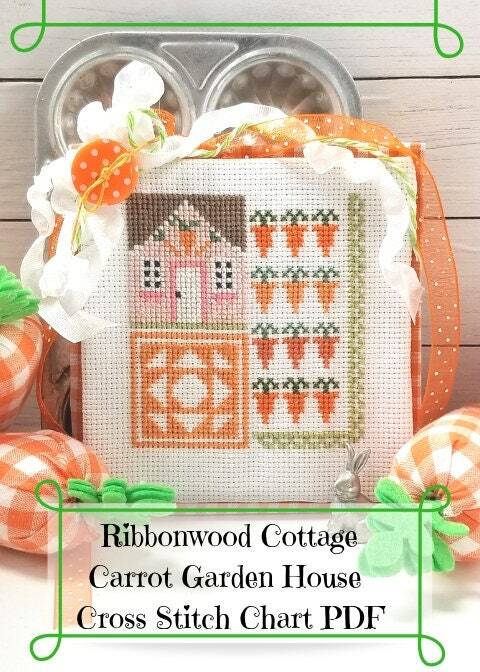 Carrot Garden House is a cross stitch pattern (chart only). 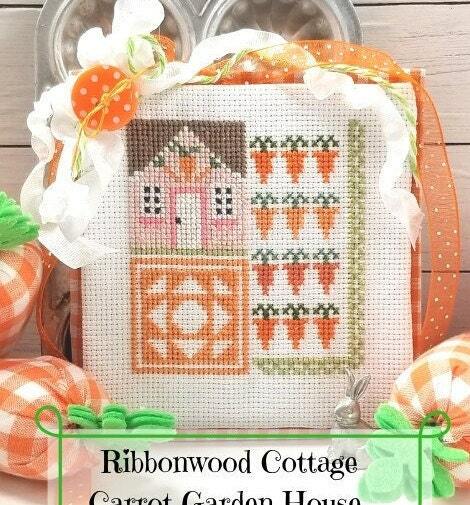 It represents spring and carrots which bunnies love! 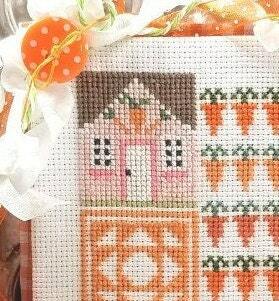 Next to the carrot garden is a sweet little pink house with carrots embellishing it. Below is a patchwork quilt. I love spring, I love quilts and little houses. Gardening has always been a wonderful pastime for me and all these things just seem to work perfectly together! This chart is for cross stitchers who can read a basic chart. This is not a pattern explaining the basics of Cross stitching. I must give credit to Priscilla Bain for the finishing technique. If you visit her instagram feed, or blog she gives directions how to finish off cross stitch pieces. 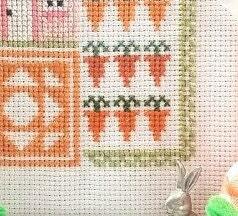 She has beautiful ideas for cross stitch finishes. I do not want to copy her work in my pattern. I do want to show off her wonderful ideas for cross stitch finishing. This design was completed on White Aida 18 count, so it is a bit smaller than if it was completed on 16 or 14 count. The actual design is approximately 3" x 3" and the finished front piece is approximately 4" x 4". DMC Embroidery floss was used. You will receive 2 files once the transaction has been completed and paid for. The first one is the cover photo and Supply list. The second file is the file which is printable. I have purchased a cross stitch design program and it is still in the working stage so please forgive me if you are not fond of it. I am trying to work the kinks out. I love cross stitch so much and it is one of my favorite things to do. Cross stitch projects can be thrown in your car and worked on at your kids sports practices (ask me what I did for 15 years during soccer practices! ), or waiting for the doctor or dentist. A little here and a little there, and the project is done! I love that I can take it with me.